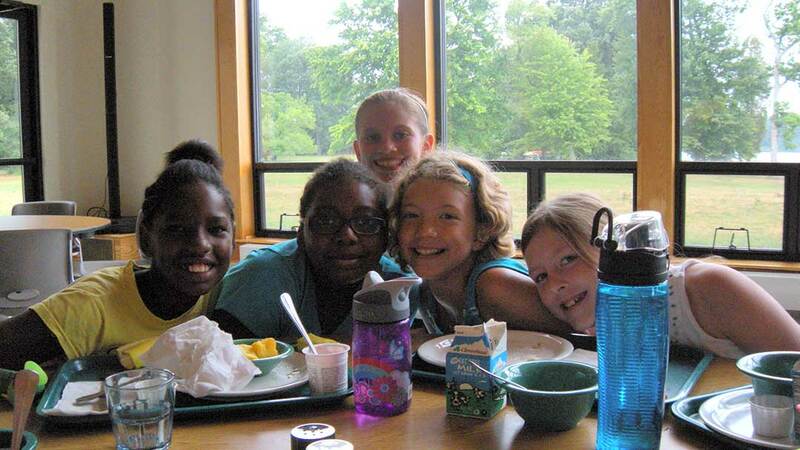 Day-campers are an integral part of the camp community at West River Center. We are excited to expand our Day Camp Program for 2019. We will be offering a mix of theme weeks for full day options. Click on each tab below to see full themes and descriptions. This week we will talk about the rainbow as God’s covenant to protect our world and love us as children. Our focus will be on how God shows hidden reminders of love and how we are called to love one another. We will have messy, colorful crafts and games! This week we will talk about weather and different emotions. Our focus will be on how we can rely on Christ to help with any problem or emotion we might face in life. We will have weather & water games and crafts! This week we will talk about fruit in a literal and theological sense. Our focus will be on some of the fruits of the spirit: love, joy, peace, kindness, faithfulness, and self-control. We will have fun fruit themed crafts and games! This week we will talk about what the kingdom of God looks like and what our place is in it. Our focus will be on the book of John. We will have luau themed games & tropical crafts! This week we will talk about how people all over the world worship God. Our focus will be on Jesus’s travels and how he gathered disciples. We will have crafts and games from around the world such as Brazil, Mexico, Nigeria, China and Germany. This week we will celebrate Christmas in July! Our focus will be on the Christmas story. We will have Christmas games, crafts, and music. It will feel just like the Christmas season, but in July! This week we will talk all about outer space! Our focus will be on how God created the universe and everyone in it in with unique vision. We will have a galaxy, planet, star theme and out of this world games and crafts. The newly added West River Science, Technology, Engineering and Math (STEM) day camp add-on activity will offer campers the opportunity to build and explore exciting hands-on STEM activities while learning about electronics. There will be two sessions of Robots and Rockets for our Day Campers this year! Campers will learn about electronics, build and soar gliders and rockets, compete in fun STEM team challenges to include the Egg Drop Challenge and Spaghetti Tower! Campers will learn how electrical components work together and build and solder several fun projects such as a Chirping Cricket, Brain Game and Robotic Car. An additional fee per camper will be applied to cover the costs of supplies and projects which will be taken home by the campers at the end of each week. Come join in the fun at our new STEM Day Camp! Registration: Registrations are first-come, first-served and are accepted online/mail with payment of $100 non-refundable, non-transferable deposit per week. We cannot take registrations over the phone. Click HERE for a paper registration. Most weeks capacity is 50 campers, the registration system will track waiting list once the week is full if you choose to be added to the waiting list. Payment: Credit cards are accepted with online registration only. No discounts for multiple weeks. No sibling discounts. Payment plans may be set up online, in order for campers to attend plans must have an active credit card on file and our offices receiving regular payments. Should payments stop for any reason, your child will not be able to attend. Activities: Campers will have an opportunity to try many different activities including swimming, boating, nature studies, hikes, arts and crafts, story time, bible study, climbing wall, archery, songs, sports, games and more. Each week will be exciting, new and fun to keep campers active the entire summer. *New for 2019 we will be offering older day campers an extra STEM option. Drop-off/Pick-up: Mondays check in will begin at 8:45am. Tuesday – Friday please drop your camper off between 8:55-9am. Pick up Monday – Thursday for half day is from 11:55-12 noon; full day is from 4:55-5pm, please pick up your camper on time. Fridays parents/campers can enjoy a slideshow of the week’s activities generally beginning at 11:40am (half day) and 4:30pm (full day). We do not offer before or after care at this time. Dress: Campers should wear closed-toed tennis shoes each day as well as sunscreen. Hats are encouraged as well. Swimming will occur everyday as weather allows. Campers can pack a change of clothes, bathing suit and swim towel. Food: Campers will receive lunch each day and also pick a snack each afternoon at our camp store. This is included in your tuition. Health Form: Once your registration is completed you will need to complete the online Camper Health Form. We ask that only emergency medications be left for day campers. Campers that do not have forms completed will not be able to remain at camp.